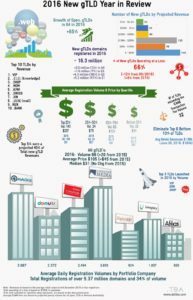 Generic Top Level Domain Registration Volume Dec 31 2014, there are 478 delegated new gTLDs. 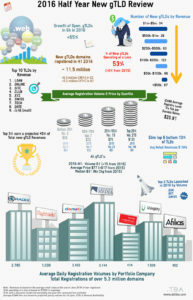 .XYZ is still at the top spot with 3,045 daily registrations and will be the first TLD to reach 750.000 registrations. .REALTOR who offers realtors a free registration program is in the second spot with 856 daily registrations which is a third of the volume it had just over a month ago. .网址 (.xn--ses554g meaning ‘web’) has an average of 505 daily registrations. .OVH, a web hosting company offering its clients a discounted or free domain, has an average of 500 registrations per day. .BERLIN, also a TLD that offers free registrations, has an average of 497. With a downwards jump of almost one hundred registrations per day, .WANG comes in at 399 daily registrations in eighth place. Two geographic TLDs finish off the top 10 with .NYC at 302 daily registrations and .LONDON at a close, 301. 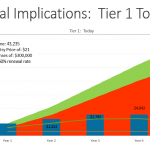 Overall, there has been a significant decrease in the number of daily registrations in the different tiers. The top quartile which was over 300 just over a month ago is now 177. this is by far the biggest decrease we have seen to date. 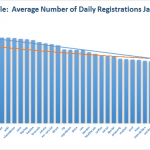 The other three quartiles have also decreased by thankfully, not at the same rate with the second quartile decreasing to an average of 29 daily registrations. 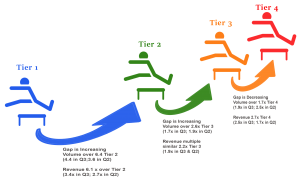 The third quartile decreased to 14 and the fourth quartile decreasing to six. The overall daily registration average of all gTLDs is now 56 which is down from over 90 a month ago. Hopefully this is just a temporary decline due to Christmas holidays!